A healthy balanced wholefood lunch can be the difference between a child concentrating or feeling tired and sleepy in the afternoon at school. Let me help you with some nourishing, healthy, gluten and dairy free ideas for your children’s lunch boxes. 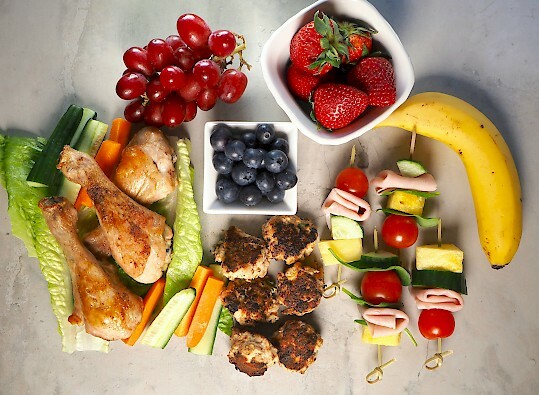 It doesn’t matter if your child enjoys variety or the same thing every day, as long as it has some protein, vegetables, healthy fats and fruit. Make it a colourful lunch that’s appealing to look at but has a variety of nutrients. Some prepping at the beginning of the week can make lunch making much easier. Your children may also be more likely to eat the food packed if they have been involved. When it comes to snacks for the lunchbox it’s tough for parents to know what is best to buy. Commercially made packet treats are often the most highly processed and sugar-laden products available in the supermarket. Manufactures are clever with their marketing and packaging to entice us but the lunchbox shouldn’t be filled with party food. I recommend that you always turn the packet over and check the ingredient list and ignore any claims on the front of the packet (see some healthy treats below and also check out my website). Start the week with vegetables prepared in sticks, slices or grated, whatever way your children like them. Store in airtight containers in the fridge. Cook extra meat or chicken when roasting dinner. Make an avocado dip for dipping veggie sticks, coconut yoghurt and have different coloured fruit washed and ready to add. Get your children involved in selecting their lunchbox food. Children like to take ownership of what they eat and feel they’ve had control over their food. A good idea is to place all your containers with the prepared meats and vegetables out on your kitchen counter or table, let your children select the foods they would like to eat and get them to add it to their lunchbox. Have rules – they need to choose a protein, 3 vegetable choices (cucumber, carrot, cherry tomatoes, snow peas etc. ), and a healthy fat item such as avocado, olives, yoghurt, some fruit and maybe a healthy low sugar, gluten-free muffin or cookie. If you find it hard to get vegetables, fruit and healthy fats into your child, you may like to add them to baked treats. I’ve included protein, vegetable, healthy fat and fruit in my Chocolate Zucchini Bread. Making items such as my Chicken and Veg Bites, that can be made in bulk and frozen, can help you to be more organized. These bites are mild in flavour, which makes them child-friendly for very young ones. Preparing food for lunch boxes doesn’t have to be hard, but the bonus of being organized will help remove morning stress. When you have dinner cooking in the oven, pop in another baking dish with chicken drumsticks or tenderloins. When you are making hamburger patties, make extra in bite-size portions for lunches. I’m guessing you get the idea of where I’m going with this. 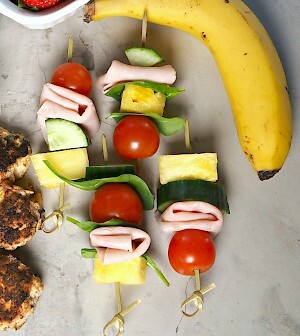 – Kebabs or skewers – use free-range ham (nitrate free) folded into squares, cucumber, cherry tomatoes, fresh pineapple and place English spinach leaves between when threading onto skewers. The skewers shown in the picture are small and have a blunt end. If you want an alternative, straws will work or try threading the food using a needle and kitchen twine. – Beef wraps – use slices of leftover roast beef, add grated carrot or sticks, cucumber, avocado and lettuce. Roll up using the beef slice as a wrap, use a toothpick to keep it all together. – Lettuce wraps – place left over chicken and salad into the lettuce leaf and roll up. Wrap or place a toothpick to keep together. – Nori wraps (seaweed) – add tuna or chicken with grated or stick vegetables, avocado or mayonnaise, rolled up tight and cut into small portions. 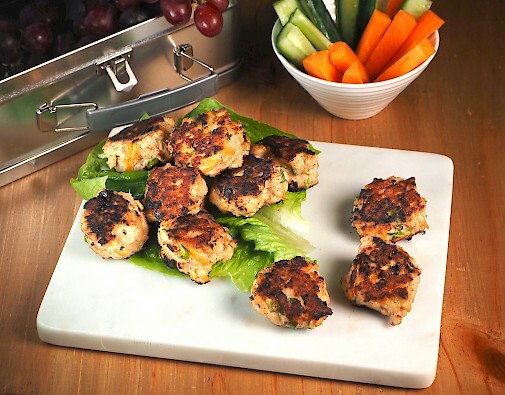 – Patties or rissoles (made with tuna, salmon, minced chicken or beef). – Sausages (purchase with no fillers or additives). – Lamb meatballs (link to Middle Eastern Lamb Meatball recipe). – Meat, chicken or egg salad with homemade mayonnaise (link to my egg mayonnaise recipe). – Tuna salad (link to Tuna Salad recipe). – Zucchini muffins (link to Zucchini Breakfast Muffin recipe). 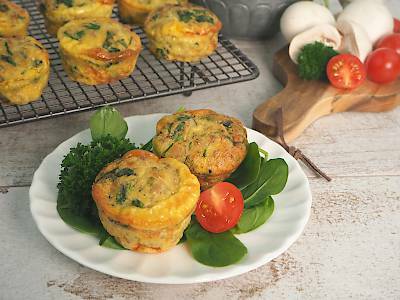 – Meat & Egg Muffins (link to recipe). – A slice of quiche. – Curried eggs or hard-boiled eggs (link to my Curried Egg recipe). – Homemade gluten-free pizza, topped with bacon or shredded chicken and veggies. – Left over Mexican dinner (check out my Mexican Bowl recipe). – Thick soups or stews – use a soup thermos with a wide opening. – Smoothies – pour into a thermos to keep cold. – Nut-Free Choc Chip Balls (link to my Choc Chip Ball recipe). – Sweet Potato & Banana Mini Muffins (link to the muffin recipe). 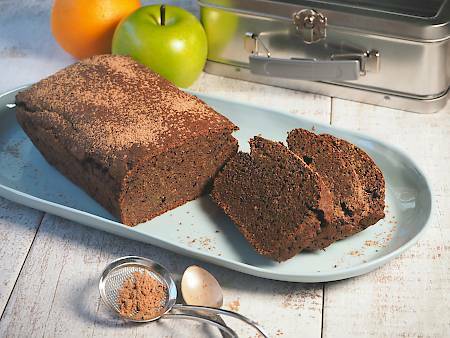 – Try this CHOCOLATE ZUCCHINI BREAD recipe, a yummy addition to your children’s lunchbox. – These NUT & EGG FREE CHOCOLATE COOKIES (link) are a favourite with my grandchildren. If your child can’t look past bread options, try the Mountain Bread Spelt Wraps. Spelt flour still contains a little gluten, but you won’t find any preservatives or additives in these wraps, only 3 ingredients (spelt flour, filtered water and salt). You can also fill them and toast in a frying pan to make toasties. I have two paleo nut-free bread recipes you can try, Sesame Sandwich Loaf and Seeded Dinner Rolls. Encourage your children to try different foods so they get a good variety of vitamins and minerals for strong healthy bones. Being a good role model will also help, as they are more likely to do what you do. Try not to comment on healthy foods you don’t like, as this may give them the idea they won’t like it either. If you would like more information on additives in many of our children’s packaged foods and their many side effects, check out my blog on Food Additives to Avoid. Choosing lunch boxes with dividers or compartments and bright coloured lids can make school lunches more fun and exciting to open. Use a freezer bag or cold packs to keep food chilled and fresh. (Two online companies I have purchased stainless steel lunch boxes from for my grandchildren are: Biome, www.biome.com.au and Hello Green, www.hellogreen.com.au). 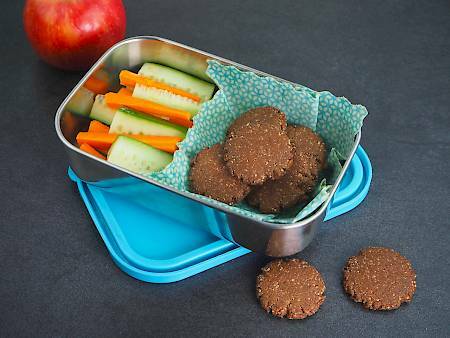 These are just a few ideas to help your child get excited about their lunchbox.